Print marketing is still a popular media for marketers to engage their target audience. In fact, this marketing channel is growing year-on-year. According to stats from a 2015 survey, the estimated global expenditure on print media is expected to go from USD 247.8 Bn in 2014 to USD 260 Bn by 2018. But print media is not without its challenges. Unlike digital marketing, it was not trackable. However, this was solved by using QR Code technology. A marketer can use QR Codes to give interested consumers an option to engage with the ad and take an action—see detailed information, watch a video, register for an event, etc. Despite use of this technology to track consumer activity, it is still not possible to know ‘who’ scanned the QR Code. Generic QR Code scanners cannot automatically capture personal information (name, email, phone number) of the scanning user. This makes it difficult for marketers to re-market these consumers in future campaigns. But this can be solved using a feature called Lead Generation. You need to check if your QR Code Generator has this feature. i. What is Lead Generation? Marketers can use Lead Generation in their print marketing campaigns to easily capture leads and build a list of potential customers. ii. How to plan Lead Generation strategy? Ensure that your QR Code differentiates itself from the competition. Add your brand colors and logo to your QR Code. This will make it look more personalised. As a result, people will not think of it as ‘some barcode for official purpose‘ but will find it attractive enough to scan it. 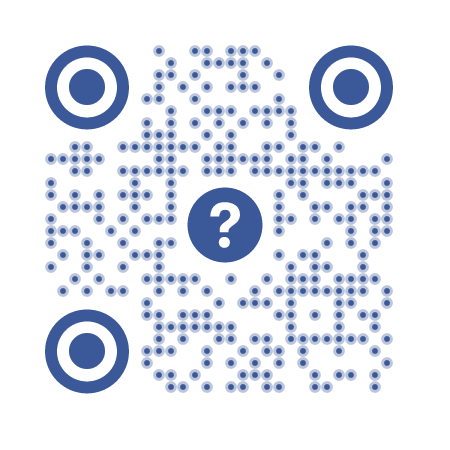 It is a fact that customized QR Codes attract much more scans than black-and-white ones. You’ll see how to set up lead generation in section iii. Once you set it up, you must redirect your audience to target content such as deal, information, or a video. iii. How to set up Lead Generation? 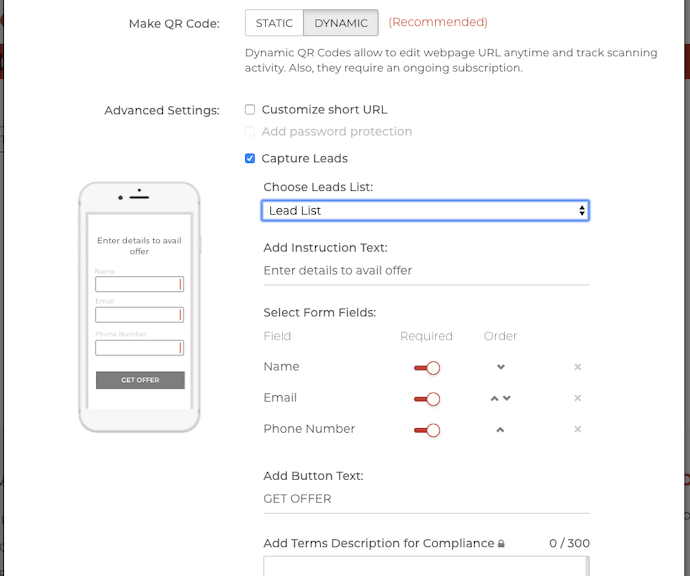 To set up lead generation, you will need an advanced QR Code Management tool such as Scanova. 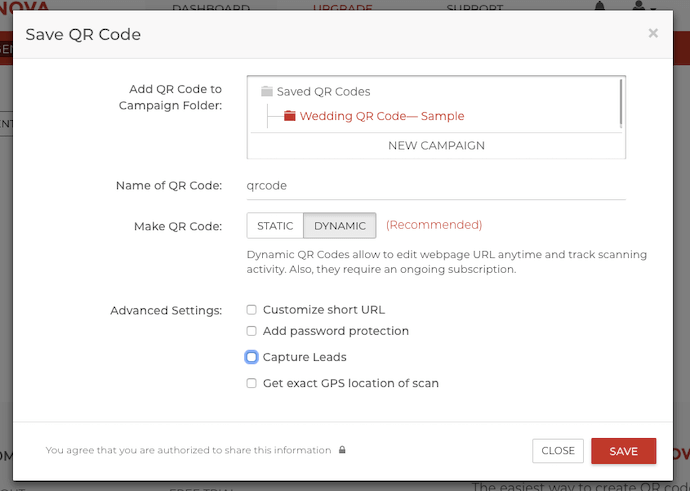 Scanova is one of the very few QR Code Management tools that provide the Lead Generation feature. 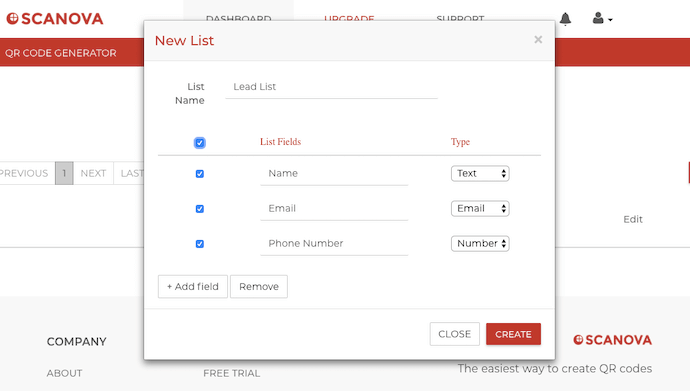 A Leads List is a database (like a spreadsheet) where the leads are saved. 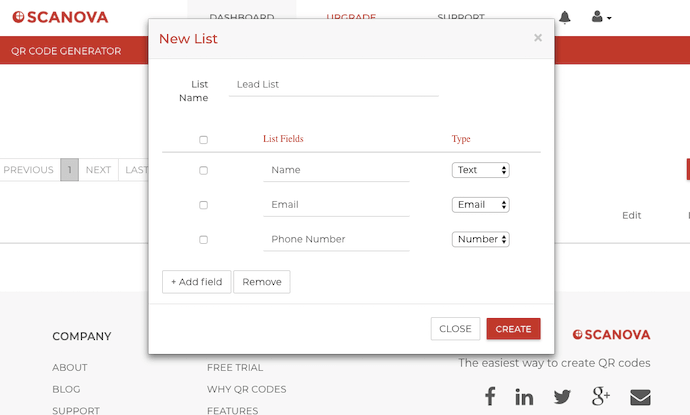 In each list, you can define fields such as Name, Contact Number, Email ID, Company Name, etc. You can add and customize the fields as per your campaign requirements. Note that you can use either a single list for all your QR Codes or you can create a list for each one of them. 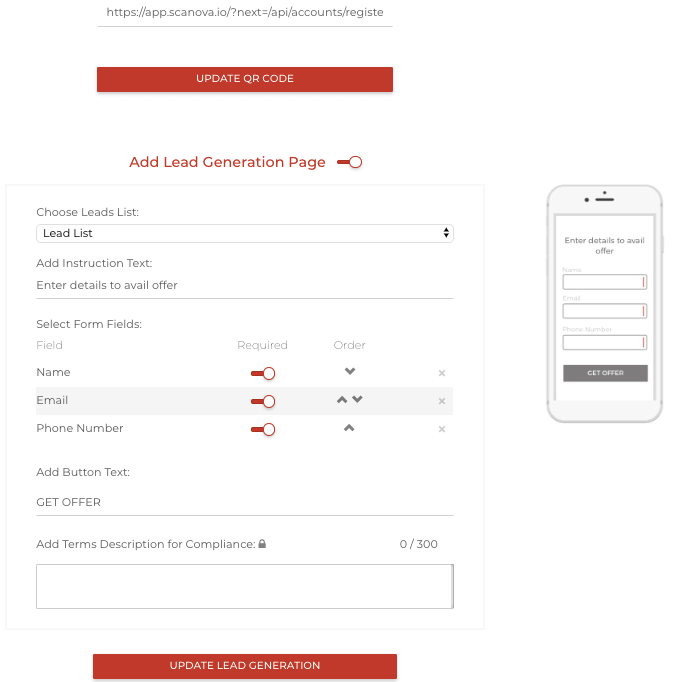 Lead Generation has now been set up. 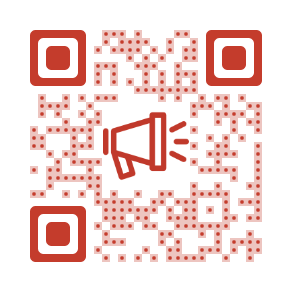 You can now add this QR Code to your marketing campaigns. The leads captured will be stored in the chosen Leads List. 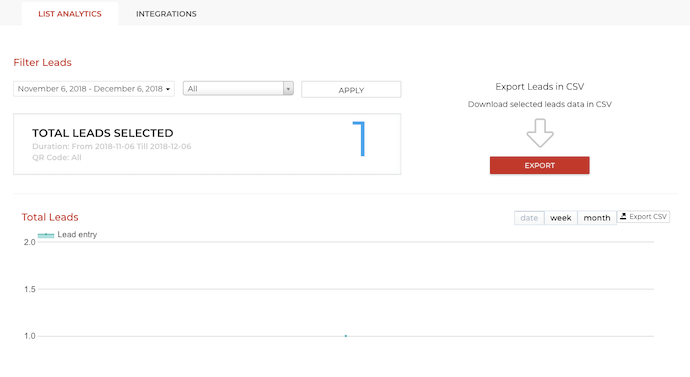 Scanova also allows you to view stats on your Lead Generation-enabled campaigns. 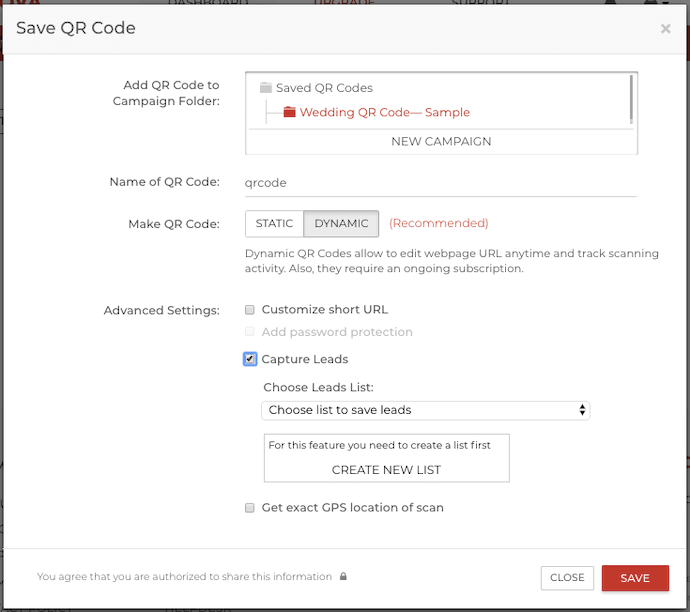 You can view total number of leads captured by time and source (QR Codes). It is also possible to export the Leads data is CSV format for further analysis. Note that you can also edit the content of the QR Code via this page. 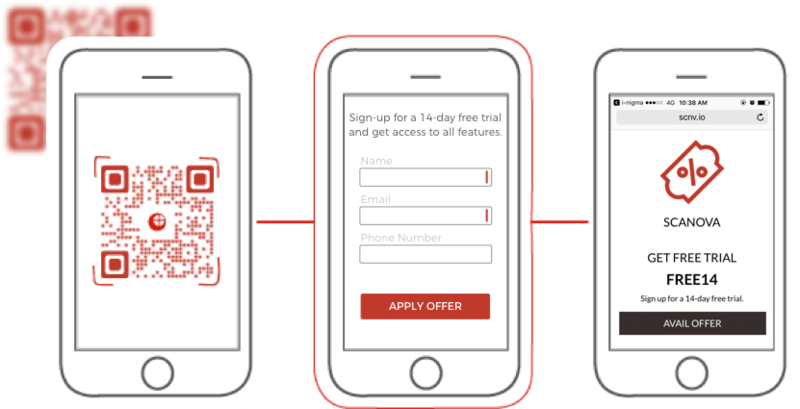 Follow the above steps to add Lead Generation to your QR Codes to build a list of highly-targeted potential customers. These leads have already shown interest in your promotional ad and even made the effort to share their contact details. With these highly targeted leads, you can rapidly increase your print media conversion rates. That’s all you need to know about Lead Generation for print marketing campaigns. So start building a Lead Generation strategy via print media today. Create visually-appealing and dynamic QR Codes for your campaigns to attract more scans and capture highly targeted leads. Still have any queries? Ask them in comments below.